℗ © 1995 ASV Ltd.
Florata is the Ensemble-in-Residence at the Centre for Medieval Studies, University of Leeds, the first medieval ensemble in the UK to be affiliated with an academic medieval centre in such a manner. 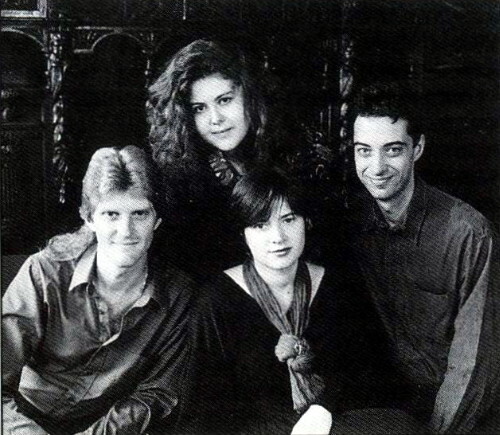 They are dedicated to the research and performance of European music through the fourteenth century, and to the traditional music of the Sephardic Jews and North African peoples. The relationship between these cultures and medieval Europe is a particular interest of the ensemble. Florata performs an annual concert series at the university, as well as several other programmes throughout the year. They are also active in the field of early music education, frequently giving lectures in combination with performances on various aspects of medieval music. The Cantigas de Santa Maria are a compilation of some 400 songs celebrating the virtues of the Blessed Virgin Mary and, in particular, recounting her multifarious miracles. They comprise what is by far the most imposing collection of medieval Iberian monophonic song to have survived, occupying a privileged position within the wider European tradition for the very reason that their music has survived alongside the texts, a feature which is sadly lacking in so many extant medieval sources. But it was no mere quirk of fate that these songs should have been handed down to us in such numbers and in so intact a condition: the project to collect and write them down was masterminded and, as it would appear, personally supervised by Alfonso X, known as 'El Sabio' (the Wise'), King of Castile and Léon from 1252 to 1284. As was the case in the other Iberian kingdoms (particularly Catalonia and Aragon), Castile and Leon had long fostered links with Provence, and the lyrical art of the troubadours would have been no less familiar at Alfonso's court than the Arabic, Jewish and other traditions which were current there at the time. In fact, we know that many troubadours sought refuge in this area when fleeing the claws of the Albigensian Crusade. The majority of the Cantigas are concerned with telling us of Mary's miracles and are referred to as cantigas de miragres. Here the narrative situations range from the everyday to the positively preposterous or legendary, and we meet people from all walks of life (including Alfonso and his subjects) engaged in all kinds of activities. Cantiga No.1 and every tenth song in the collection are cantigas de loor, hymns of praise to the Virgin, and these so-called 'decadal' songs are often written in a slightly more elevated style. In almost every case, the form of the songs consists of several verses (estrofas), each of which is preceded and followed by a recurring refrain (estribillo). The verse itself is usually divided into two sections: a vuelta with its own distinct melody, and a mudanza, whose melody is often based on that of the refrain. The form is thus akin to the French virelai and the Italian ballata, and has a further parallel in the Arabic zajal form, though which of these three can be said to be its prototype is uncertain. The language of the texts is Galician—Portuguese, a vigorous living tongue which had been refined for more literary use by the troubadour-influenced poets of Santiago de Compostela. This soft and pliant medium is well-suited for the subtle demands of dramatic evocation and euphemism, both of which are exploited to the full in the popular idiom of the texts, which though always striving to report the full facts at hand, sometimes veering towards sensationalism in the process, usually manage to do so without sinking into gratuitous crudeness. The Cantigas de Santa Maria emphasise the Virgin's human aspects and, above all, her willingness to be involved in ordinary lives. Although these songs would often have been performed in courtly settings, they nevertheless possess a far wider appeal and were almost certainly compiled for the enjoyment and entertainment of all. The fourteenth-century manuscript known as the Llibre Vermell ('Vermilion Book') originates from the mountain monastery of Montserrat near Barcelona. lt survived the destruction of the monastic archive by Napoleon's army in 1811 only because it had been lent out at the time; it was returned to its home in the 1880s with a new red velvet cover, from which it gets its name. The contents are ten pilgrim songs (Cants dels Romeus) that would have been sung and probably danced by pilgrims on their way to the shrine on the eves of great festivals, then performed on the feast days themselves with even greater magnificence, as is stated in the manuscript, 'to refresh the weary pilgrims and stimulate them to religious fervor'. The melodies are apparently folk tunes to which sacred words were added: the New Oxford History of Music suggests that the original lewd, worldly texts would have been replaced by sacred ones, in an anti-courtly didactic spirit akin to that of, for example, the Irish Red Book of Ossory. These texts are partly in Latin, partly in Catalan. Of the musical settings, five are for two or three voices. Three of these are among the earliest known recorded canons. The Codex Calixtinus is a most important collection of polyphony from twelfth-century Spain, dated at about 1140. It is included in the Liber Sancti Jacobi, a larger manuscript housed in the cathedral library of Santiago de Compostela containing guidelines for pilgrims as well as services for the Feast of St. James, which, fortunately, survive with music, 21 pieces in all. The manuscript derives its name from the belief that Pope Calixtine II (d. 1124) was the author of the Offices and Masses for this feast. It contains two-part music and the earliest surviving piece for three voices. The music has much in common with the repertory of St. Martial, and it is possible, even likely, that many of these pieces are French in origin. The Las Huelgas Codex is so-called because it is housed in the Las Huelgas Convent near Burgos in northern Spain, one of the most important medieval Spanish nunneries. Founded in 1180 by Alfonso VIII of Castile and his wife Eleonore, its nuns became famous for their learning and scholarship. The manuscript dates from the later thirteenth century, but contains sacred pieces from the earlier part of the century as well as fourteenth-century additions, both monophonic and polyphonic. Many are of Spanish authorship, or differ from their counterparts in the rest of Europe, and thus, like the Cantigas, provide a valuable record of Spanish musical activity at the time. In considering the music of the Sephardic Jews, as well as that of the Moors, we are not in the same realm as Christian music. Indeed, while many questions remain concerning the musical practices of Christian Spain, even more exist regarding the music of the Jews and Moors, because their music was not written down. Thus, we have to look at what examples of music survive today by way of oral tradition and try to relate them to what the music of the Moors and medieval Sephardim may have sounded like. This is not as improbable as it seems. It may appear unlikely at first, but music passed on by means of oral transmission often changes much more slowly over time than a musical genre that relies upon written notation. Musicologists have long considered the traditional music of Morocco, Algeria and Tunisia to be at least in part a survival of medieval Andalusian music, as it was untouched by Turkish influence. The reasons for this go back to the idea of these oral traditions changing much more slowly than those of western 'art music'. In the case of the Sephardic Jews there is in fact a large body of traditional songs passed down orally. They are in the language of Ladino, or Judeo—Spanish, a common tongue among the Spanish Jews. It seems likely that when the Jews and Moors left Spain following their expulsion in 1492, they simply carried on making music as they had always done. In fact, the insular nature of the North African communities may well have done much to preserve some of these melodies, for here they were untouched by European crusaders and the Ottoman advance. There were Sephardim who settled in the Ottoman Empire as well, and their music displays Turkish musical styles. The influence of the Moors on the culture of Spain was dramatic. There is a great controversy concerning the extent of the influence of Arabic musical practice upon the music of medieval Europe. It has been the trend recently to play down this influence, owing to the fact that western medieval music shows little Middle Eastern influence in the music itself. This has led some to conclude that we cannot look to contemporary Arabic practice to gain clues into medieval performance practice. This, however, overlooks certain points. lt must be remembered that vast amounts of music from the Middle Ages have not survived, because music was often improvised, and melodies were transmitted orally. A direct piece of evidence, for example, is the documented practice of incorporating the tuning of one's instrument into the performance, a practice taken directly from Arabic music, and one that is still used in North Africa today. This appears to have been popular in medieval Europe, where listeners apparently delighted in the strange sounds produced by the tuning of harps and fiddles. In attempting to recreate the music that the Moors might have enjoyed, we must look again to contemporary North African music. Of particular interest is the form known as the nouba, or nauba, an extended piece that is performed at a particular time of day. lt is in fact a series of songs grouped together according to a pre-established order and written in the same musical mode, and containing both vocal and instrumental elements. The medieval Andalusian musicians were said to have performed these with considerable skill. According to the book of Al Haik, there were originally 24 noubas, one for each hour of the day. Regrettably, not all of them have survived. Those that have are often incomplete. How much of this music dates from the Middle Ages, if any, is uncertain. lt is likely, however, that at least in part the noubas represent a survival of medieval Andalusian melodies. In Spain, the variety of instruments in use that were of Middle Eastern origin was immense. These instruments were widely-used among Jews, Christians and Muslims, and are shown in numerous illuminations in the Cantiga manuscripts and in other iconography. lt is therefore possible to gain some insight into medieval Spanish performance practice by investigating how these instruments were and still are played. There has been a relatively unbroken continuity of playing technique for many of them. Again, there has been controversy over the extent to which Arabic performance practices were used. Some have gone so far as to deny any direct influence, again owing to a lack of written evidence. This, however, seems to go against common sense, given the strong presence of Moorish musicians at Christian courts. The theory that all of these instruments were borrowed but that none of their playing techniques were seems unlikely. There have been some scholars who have denied that instruments were even used with the Cantigas, despite the iconographic evidence. Their argument is that these pictures are symbolic representations, much like the images of King David playing his harp in illuminations in psalm collections. Again, this ignores the iconography itself, for great care has been taken to show not only an immense variety of instruments, but also to show different groups of players, including not only Jews and Moors, but also Basque musicians in their national costume. lt is a fact that Moorish musicians and instruments were used in Christian festivals, probably the same celebrations for which the Cantigas were intended. 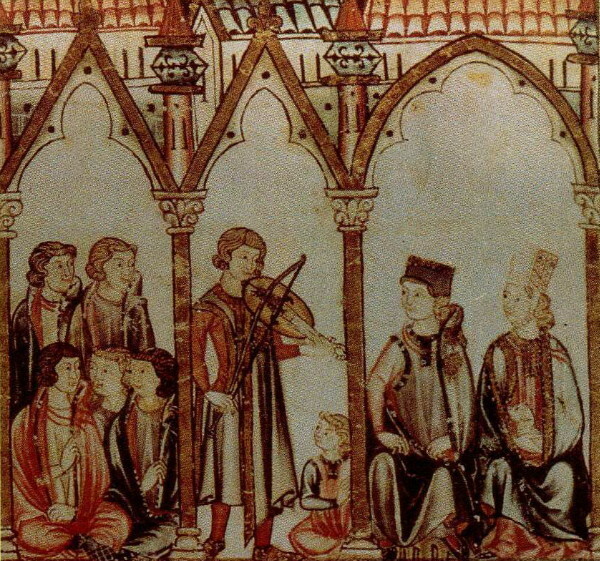 The Valladolid Council of 1322 forbade the hiring of further Moorish musicians for Christian feasts out of fear that they were enlivening them too much and causing controversy. This suggests a widespread practice and gives further evidence to the theory that the Cantigas and other Spanish songs could be performed with instrumental accompaniment. 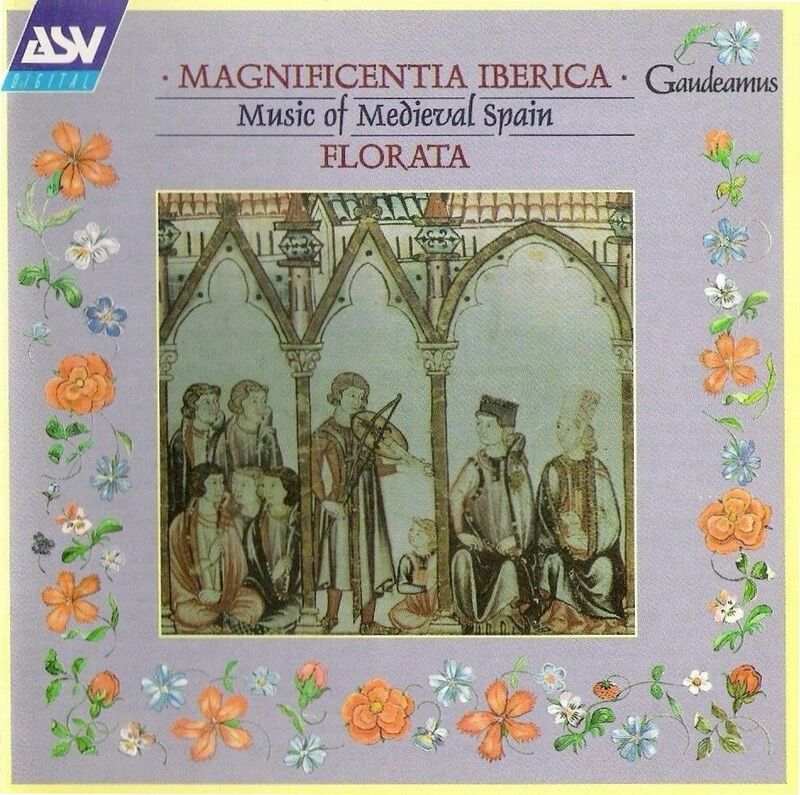 This repertoire, Christian, Jewish, and Muslim, is remarkable for its variety, and shows the richness of musical fife in the multicultural society of medieval Spain. lt is our hope that these recreations will convey some of that sense of richness, and that this music will reach out across the centuries to touch those that hear it.